The first time I was asked to join a board, I was so honored that I said "yes" without understanding what it truly meant to be a board member, let alone how to be an effective board member. I think a lot of people do the same thing. And, honestly, I think a lot of nonprofits ask people to serve on their boards, often not fully understanding - and therefore, not clearly communicating - the responsibilities that the board members have in the management, oversight and success of the organization. That's right. Board members are legally responsible for your nonprofit. These responsibilities are often called the "Three Ds": the Duty of Care, the Duty of Loyalty and the Duty of Obedience. Board members are responsible for the governance of the organization while the executive director is responsible for its management. In addition to their legal responsibilities, board members have financial responsibility for your nonprofit. 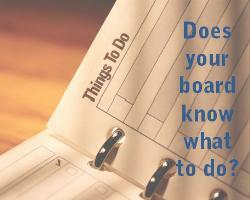 Among their duties, board members maintain oversight of your nonprofit's finances. They review financial reports. They approve budgets. They ensure that the organization has sound financial policies and internal controls. The board ensures that your nonprofit is both transparent and accountable to your donors and the general public. As part of their financial responsibility, board members are responsible for ensuring that the organization has the resources it needs to be effective. Fundraising expert Gail Perry offers these 10 practical ways that board members can help with fundraising. I love this list because every single board member can successfully complete all ten items. I promise. The #1 thing that your board members should do is make a personally meaningful annual contribution to your organization. When a grant application - or anyone - asks how many of your board members make a gift, there is only one correct answer. Send me a message and tell me if you've received a gift from 100% of your board members. If you haven't gotten there yet, don't worry. You will when you employ these 7 proven ways to get your board members to give. Just like there's more to grant writing than just "writing," there's also more to fundraising than just grants. And board members are a key to your fundraising success. Check out this month's tips for how your board members can be an active - and effective - part of your fundraising efforts.